It was originally granted to Rev. Ebenezer Flagg, The 1857 map owner is Mrs. Bell. The 1892 owner: Dr. A.L. Emerson. There are three distinct sections to the Douglas building. The original house (now the ell) was reportedly built by Rev. Ebenezer Flagg, second minister of the Congregation Church, in 1736 on land purchased from Moses Hale. The Rev. Ebenezer Flagg was ordained as minister of the Congregational Church in 1736 and served the congregation for 60 years. He built the simple ell section and lived there for the rest of his life. Governor John Bell bought the property in 1802. He turned the house around and added an impressive Georgian front section in 1806. This property now took its place with other beautiful homes on Chester Street. The Governor made important decisions here, not only for Chester, but also for the state of New Hampshire. Dr. Arthur Emerson opened his medical practice here in 1883. He added the Victorian turrets the porch and the elaborate entrance that gave it a Victorian appearance about 1900. He served as Surgeon General for the State of New Hampshire and was active in the community. 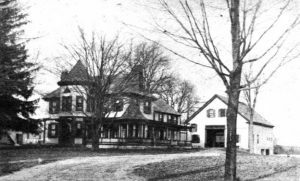 The town purchased the property in 1929 from Mrs. Lurette Emerson, Dr. Emerson’s widow. A trust fund had been growing over several years to establish a home for the elderly. It was called the Wilcomb Townsend trust fund. In 1930, members of the trust decided to establish the home here. The home never met the town’s expectations and in 1946 it was sold to Albert Warren. Bert Warren collected milk from local farmers in large tank trucks and the spacious barn was perfect for his needs. It was purchased by White Pines College (now Chester College of New England) in 1976. It was named Douglas Hall, after Mrs. Samuel (Spin) Douglas who was the first chairman of the Board, and a close friend of Faith Preston. The following year a $10,000 photography facility in the attached barn opened to house a new degree program in Professional Photography and a double tennis court on the grounds of Douglas Hall was completed in 1977. In 1999, the college received a gift from an anonymous donor to renovate the Douglas Photo Barn. Due to a continually growing enrollment, Douglas Hall was converted into an Art Building in the summer of 2000. Enrollment decreased and the school closed in 2012. When the building went up for sale Bittersweet Blessings Shop purchased the property and is now located there.